It's that time of year again, when we see all kinds of special edition holiday dolls and accessories. Today on a very quick stop at Target I came across two holiday edition dolls that we have seen versions of over the last few years. 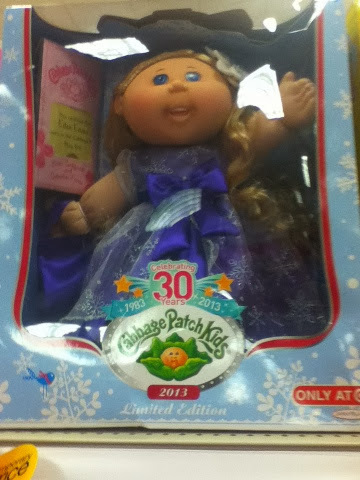 The first is the Special 30th Anniversary Holiday Edition Cabbage Patch Kid. I think she is really cute, but I have a soft spot for CPKs. It seems blue is one of the main holiday colors this year across several lines. I do like her dress and her slightly curly long hair. The second was the Target exclusive Holiday Surprise Barbie. Target usually has store exclusive dolls at the holidays in edition to the yearly Holiday Barbie. I like her dress and she is a cheaper alternative to the more expensive Holiday Barbie, but she is not as elegant looking. These are just a few of the special editions out there and we will be featuring more soon. Do you have a favorite holiday release this year?